Today our homeschooler and I reviewed the School of Tomorrow Curriculum’s 5 Laws of Learning as pointed out in the handbook given to us when we started our Level 1 Curriculum. We are currently halfway through Level 4. Student must be placed at the academic level in each subject where they can perform. Reasonable goals must be set each day. As homeschoolers, we have to be reminded of these non-negotiables even as it is so easy to take these things for granted when we have the liberty of homeschooling like we do. Learn what makes Singaporean students the best in Mathematics. Find out how this new trend in education called Singapore Math makes Math concepts easier and faster to grasp and why top schools are adopting it. Educators, homeschoolers, school administrators and parents can avail of the Super Saver Discount until August 15, 2011. 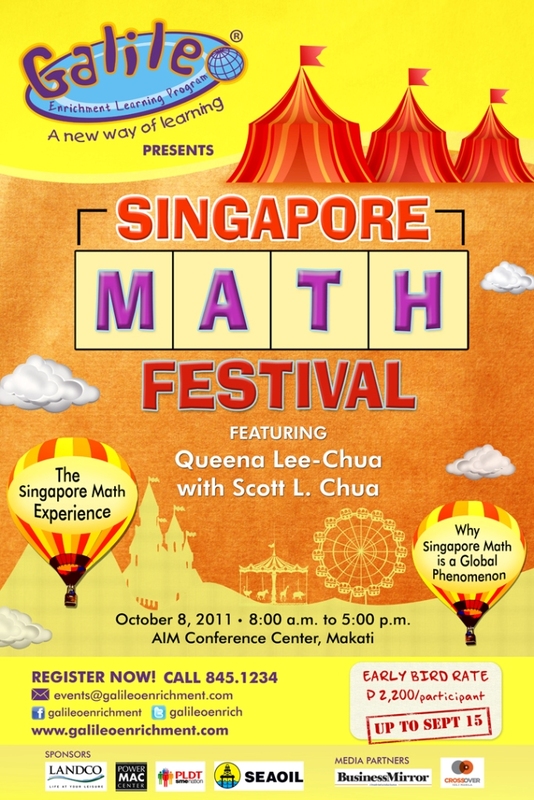 Singapore Math Festival, the country’s first Singapore Math conference will feature Dr. Queena Lee-Chua, a Math Professor and multi-awarded educator. Notable speakers from schools who have adopted the Singapore Math will also share their experiences and teaching successes and how they make this method appropriate for the Filipino child.